Can the UbiSlate really be any good? See all your apps. All of them. Step aside, £70 tablets: there's a new low-rent slate in town and the UbiSlate 7Ci tablet will set you back just £30. That's right, you can now buy an Android tablet for less than the cost of a decent haircut. And what do three crisp tenners get you? Android 4.0.3 (Ice Cream Sandwich), to start with, and a 7-inch TFT 800 x 480 screen which, as you might expect, is pretty low-grade resolution-wise. The 1GHz processor and 512MB RAM combo doesn't sound too inspiring either, but while there's only 4GB of storage, the tablet comes with a microSD slot so you should at least be able to keep a decent amount of digital bits and pieces on board. The slate also comes with Wi-Fi connectivity which we wouldn't usually mention but for £30 it's reassuring to know. If you're feeling a little more flush, there's also the UbiSlate 7C+ and 7CZ to consider, which come with slightly better specs and data connections. 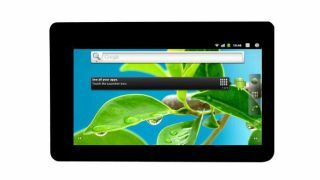 The tablets, which have already proven more popular in India than the iPad, were primarily intended for schools but if you're tempted to risk £30 on one then you can buy one for yourself from Datawind's website.